For offices, lobbies, corridors as well as institutional uses in schools, hospitals, and other healthcare facilities. 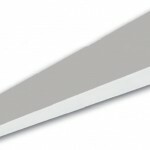 Designed to be surface mounted or suspended. Optional continuous row mounting available.